UN-Habitat Sri Lanka | Improving the Learning Environment in Mannar District: Ground-breaking Ceremony Held at Eachalavakkai Government Tamil Mixed School. 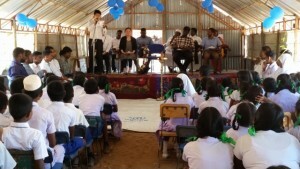 UN-Habitat Sri Lanka > News > Learning Environment in Mannar News > Improving the Learning Environment in Mannar District: Ground-breaking Ceremony Held at Eachalavakkai Government Tamil Mixed School. Improving the Learning Environment in Mannar District: Ground-breaking Ceremony Held at Eachalavakkai Government Tamil Mixed School. 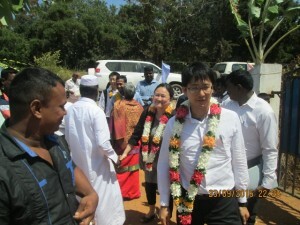 23 September 2016, Mannar District, Sri Lanka. A ground-breaking ceremony was held at Eachalavakkai Government Tamil Mixed School in Mannar district today to commence construction activities for new school buildings and WASH facilities. This initiative is funded by the Government of Japan through the project “Sustainable resettlement through community-driven improvement of the learning environment in Mannar district, Sri Lanka”. This project is implemented by UN-Habitat in collaboration with the Ministry of Education, Provincial Ministry of Education in the Northern Provincial Council, Zonal Education Offices in Mannar and Madhu and other stakeholders. Mr. Masayuki Nakatsukuma, Second Secretary, Embassy of Japan was the chief guest at the event. Mr. T. John Quintus, the Zonal Director of Education, Madhu division, Mr. Masato Suehiro, teacher assigned to the Zonal Education Office, Mannar by the Japan International Cooperation Agency, religious leaders, school principal, teachers, school children, parents and UN-Habitat officers also participated at the event. 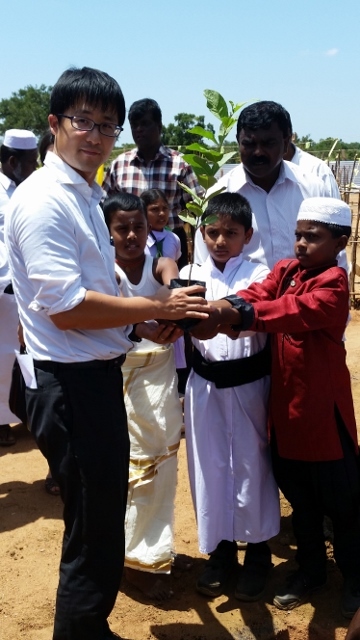 Following the laying of the foundation stone, tree saplings were planted by the invitees and school children in the school premises to commemorate the event. The ground breaking ceremony was organized by the School Development Committee of the Eachalavakkai Government Tamil Mixed School. At present, 221 children are enrolled at the Eachalavakkai Government Tamil Mixed School. The school currently has only one permanent building which accommodates four classrooms. The other five classrooms are located in a temporary structure with minimal facilities. In order to improve the learning environment of the school, a school building including classrooms, canteen with kitchen and storeroom, convertible auditorium, and water and sanitation facilities will be constructed through the project.